When using these links, please do not select or continue to use any that require payment. Most popularly declared major for many 4 year college and universities is "Undecided"
https://secure.ihaveaplaniowa.gov/ is an online tool chest of personal assessments, career descriptions, college search engines, and even scholarships related to career & college program interests. Each Panorama 8th Grader & HS student has created an account to complete the guide-way activities per grade level; explore this large website to explore career possibilities. http://www.bls.gov/ooh/ "Occupational Outlook Handbook" descriptions, future outlook, and necessary training for most jobs in U.S.
Washington Post, February, 2015 "Want to do what you love and get paid for it chose one of these majors"
Pg.2, list of statistics showing value in community college trades programs in comparison to 4 yr colleges. Travel to a DMACC campus for their Career Discovery Days to see differing programs scheduled throughout the year. These 1-2 year programs are popular & seem to have good job placement. Career Discovery Days are available at most DMACC locations, but transportation is provided for the Perry, Iowa, VanKirk Center Career Discovery Days. Look at different college majors and see what jobs different colleges report graduates doing. - University of Iowa - What Can I Do With This Major? - Iowa State University - College of Agriculture & Life Sciences Career Day listing of companiesgoing their to hire graduates. - University of Massachusetts Amherst - What Can I Do With This Major? 6. Look over our nation's Fastest Growing Jobs and research what characteristics and training the jobs need...if you don't know what job you want you might as well consider jobs that are growing and need people to begin your career adventure. how did the person become tied to their job? what challenge(s) did they overcome? what advice did they share? What themes are present in your early memory story? Describe the setting & main characters. What was the focal issue (challenge, problem, or surprise)? How did you respond to the issue? Do you see connections from the early memory story to values, beliefs, strategies, or activities you have today, or may have just always had? What career activities connect to your values, beliefs, strategies, or activities from your early memory story? 11. Iowa's Career Coach Online - take a quick or thorough Career Assessment to find occupations that fit your preferences, make a resume using the Resume Builder, (http://www.futurereadyiowa.gov/ website posted for free use thanks Iowa Workforce Development partnering with Iowa's colleges). Many community colleges are encouraging their students to use Career Coach, like Iowa Central in Fort Dodge - take a look at their career webpage and enter Career Coach after looking at the other suggestions ICCC has for students. Complete a Jung Personality Survey (http://jung.test.typologycentral.com/) and review 4 letter code matching careers (using Ball State's Career Counseling webpage = https://www.bsu.edu/about/administrativeoffices/careercenter/tools-resources/personality-types)...the answering the questions takes higher thinking than most such surveys shared with middle and high school students. 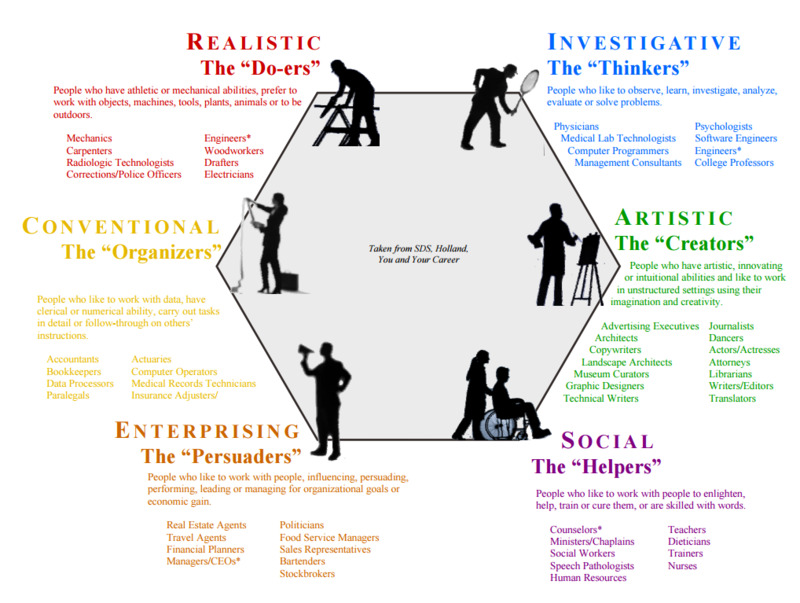 1st, Gr.6-12; Get a Visual of the Holland Career Model to help you Learn about careers in relation to your interests using Holland Interest Hexagon graphic. With more life experiences we tend to have more interest in 1 or 2 of the 6 areas, with less life experience we may have a more balanced/even interest in the 6 areas. 3rd; use 6 areas of classroom to represent 6 different codes to facilitate student mingling at this "Party"
Iowa Central Community College in Fall of 2015-16 launched "Career Coach", which offers for free a quicker "Just Get Started" Holland Code Finder & a "Take a Longer Assessment" Holland Code Finder, both assessments give a listing of college career programs to consider - Click here to use either Career Coach assessment to get yourself a Holland Code. Want to know difference between a diploma and a degree? What training do you need to get those jobs? Iowa State University uses 6 Holland Codes to describe their majors online, but calls the Holland Codes "Career Keys". Click on any of their majors to see the personal interest types (Career Key), then if you click on the Career Key given all the majors that correspond to that interest area are listed. Find a possible career study path linked to list of Holland Codes with corresponding College Majors - use your top 2 or 3 Holland Code areas, click on the given career clusters that seem interesting to you, read over the description & click "Careers in this Cluster" again to see list of occupations for your shopping. Review careers interesting to you and look for ones have the amount of education, salary, & future growth you are comfortable with considering more. Jung Typology also used by therapists to help romantic couples, co-workers, etc. understand one another, so many websites have tools at cost for these applications - please remember to not pay for any online activities while completing school guidance activities.
" pdf (either edit the pdf or print it off and complete by hand) 2pg 48 question survey with code finder & description of 6 areas with personality tendencies. Online, Vocationary, Holland Code Career Search Tool, once you know your higher code (and code area you want to avoid can also be used), use this online tool that allows for selection of education level also, to see Jobs that Match Your Holland Interests.